The answer is easy, free, and enjoyable: read to your children – every day. It almost seems too easy to be true. Parents do not have to spend lots of money on reading programs, do not have to design elaborate study routines, or even devise complicated reward programs. Just sit them next to you and read. 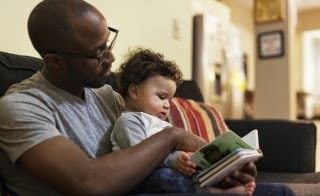 If they are young and especially wiggly, read to them for as long as they will stay with you and try to make the reading session a little bit longer each day. If your child is happy to sit and listen, then learn to engage them in the story by asking questions or encouraging them to predict what will happen next. Language development: not only vocabulary, but also language patters that will help your child decode words. Brain development: A child’s brain is busy trying to figure out what is important and what is not. When you read every day you will help your child to strengthen the reading, language, and learning parts of the brain. Social skills development: stories will help your child to develop empathy and pro-social skills. Self-regulation: children who learn to sit still and pay attention to a story will also be able to perform this skill in school. Abstract thinking: stories encourage children to keep a mental map of what is happening. This is important to comprehension, but also develops abstract thinking skills used in creativity. Do not forget to include Bible books in your reading time. Do not stop reading to your children when they learn to read on their own. You will continue to develop their language and comprehension by reading stories that are a bit too hard for them to read. Your local public library can supply you with more books than you can imagine. If you purchase books and find your children have outgrown them, consider donating them to a city mission, a childcare center, or leave them at your pediatrician’s office for parents to take home. Spread the love! Spread the reading!